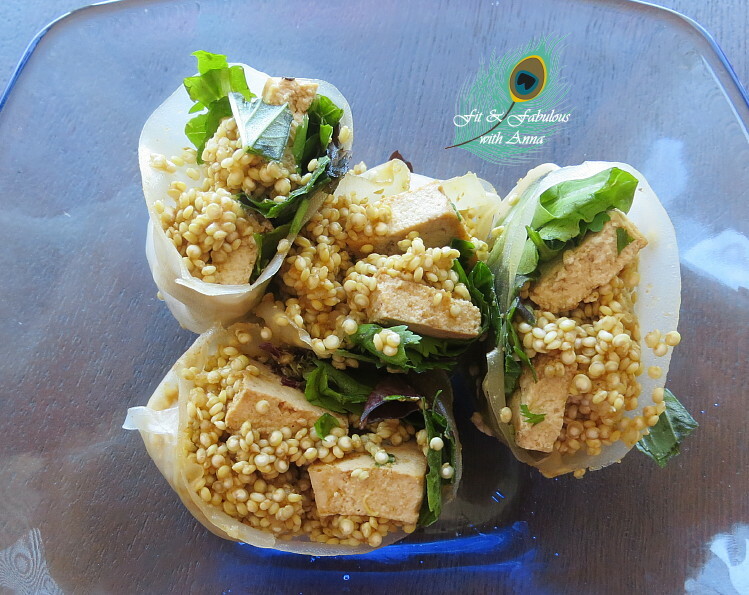 Rice paper is a staple in Vietnamese cuisine, made from rice, water, salt, and tapioca starch and looks translucent. They are dried on bamboo mats which is why they have a woven pattern on them. 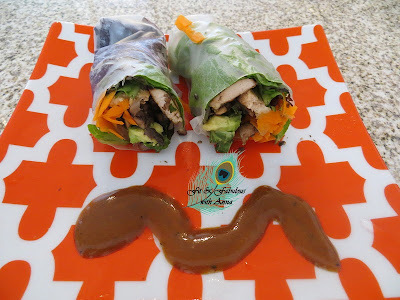 I wanted to expand my horizons and try something new so when I saw the rice paper wraps sitting on the shelf in the Asian aisle at Whole Foods I thought it would be fun to try! 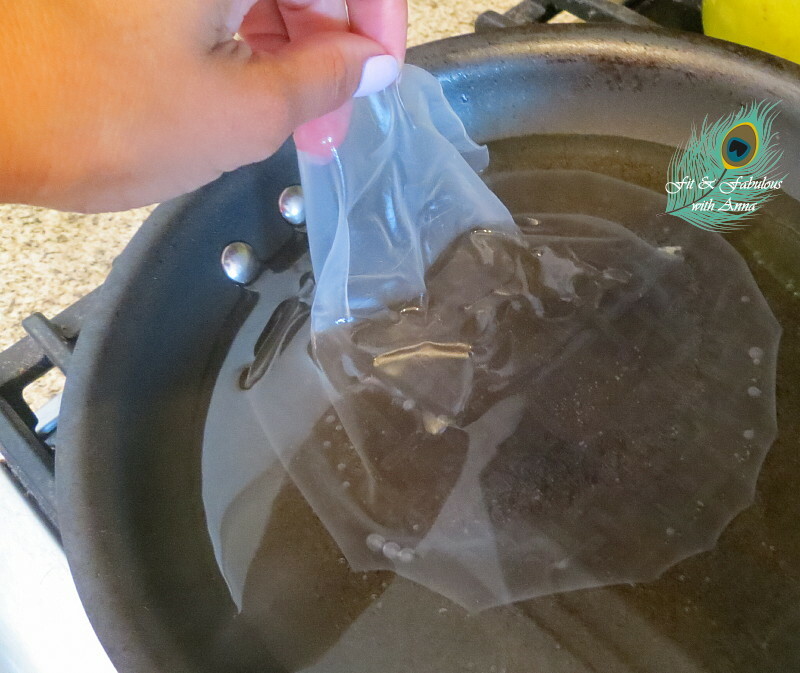 I learned that you can't use a rice paper wrapper straight out of the package, you have to first make them pliable by rehydrating it by soaking it in hot water but if you soak it for too long it ends up sticking to itself similar to plastic wrap. It's a bit tricky to do, but I easily got the hang of it. Cut tofu into slices and arrange in a single layer on a skillet sprayed with cooking spray. Season with Braggs liquid amino. Flip when bottom side is golden and spray Braggs on the other side. Saute the chopped mushrooms and remove access water. Dip the wrapper in hot water timed according to the package directions, every brand is different. Then re,ove from water and lay it flat on a plate and place a few salad leaves on it first. Be sure to remove the stiff spine from the lettuce leaf so it won't tear the wrapper. Then add a small amount of the rest of the ingredients, I put in only two pieces of tofu. I found that the trick to the rice paper wrappers is to not over stuff it or the wrapper will tear. Pour some peanut sauce on the plate as a dipping sauce. I made it a second time with seasoned quinoa, tofu, greens with a sauce mixture of equal parts rice vinegar and soy sauce, with a little sesame oil and fresh minced ginger and garlic. I filled the wrapper with two tablespoons of quinoa, two pieces of tofu and some greens.